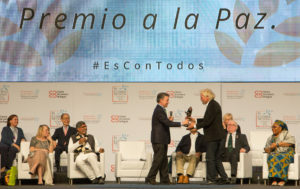 The 16th World Summit of Nobel Peace Laureates in Bogota, Colombia last week supported the country’s new peace accord and honored Sir Richard Branson, Founder of the Virgin Group, with a peace award for his work in global peace building. groups attending the World Summit of Nobel Peace Laureates.  The Summit, founded by Mikhail Gorbachev and now in its sixteenth year, presents the Peace Summit Award each year to an artist or leader who has made significant contributions to peace building and human rights. Former recipients include musicians Bono, Peter Gabriel, Bob Geldof, and Annie Lennox, actors George Clooney and Don Cheadle, and others. “One of the most important aspects of building peace in Colombia will be fostering entrepreneurship and creating opportunities for our young people,” said Santos. 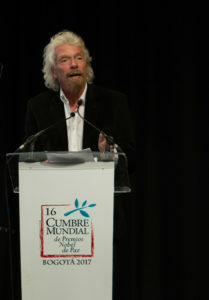 “Richard Branson is not only an internationally admired entrepreneur but has supported and encouraged young entrepreneurs and bright thinkers in Africa and other regions of the world where they can make real change. Through his work with his foundation, which has had global impact, he has also proven to be a true peace builder himself. telephony, leisure living and more, founded Virgin Unite in 2004. The foundation has incubated programs and created networks to come up with entrepreneurial solutions to global issues including The Carbon War Room, The B Team, Ocean Unite, The Elders and the Branson Centre of Entrepreneurship, which trains and mentors entrepreneurs in Africa, the Caribbean and elsewhere. Branson has been outspoken on the failed war on drugs, the fight for universal abolition of the death penalty, and his support of refugees caught in the current crisis. Over a decade ago Branson and Grammy Award-winning musician Peter Gabriel conceived of a small, dedicated group of global leaders who could use their collective experience and influence to help tackle some of the world’s most pressing problems. In July, 2007 they and former South African President Nelson Mandela and his wife Graca Machel, launched The Elders (http://www.theelders.org/), with Archbishop Desmond Tutu, former US President Jimmy Carter, former UN Secretary General Kofi Annan and other Nobel laureates and global leaders. The group is approaching its tenth anniversary.